Oh did I love this audiobook, one of my favorites; the magical realism reminded me of Bone Gap by Laura Ruby but the carnival traveling shows reminded me of The Night Circus by Erin Morgenstern! This is also part of the Hub Challenge, Morris Award winner I am involved in completing. There are 2 rival shows - the acts of the Paloma's are mermaids and the Corbeau's are birds and along with this is a long history of hatred, lies, secrets, taboos & suspicions. Enter Lace (a Paloma) and Cluck (a Corbeau) who happen to save each other on separate occasions. From this meeting, all of the sick family history and taboos sever Lace from her family but luckily she secretly works for the Corbeau family as a make-up artist. And it is here that Lace & Cluck fall in love and the long standing myths are tested, revealed, and overflow in a magnificent scene where Lace & Cluck take on both families. McLemore's plot, setting, imagery, dialogue and language (French & Spanish) drew me in and had me rooting for Lace & Cluck. Especially beguiling were the narrators, Kirby Heyborne and Cynthia Farrell, they brought this magical world to life and continued the fantasy as each chapter unfolded and the reader was plunged into this world of urban fantasy. Highly recommended!!! 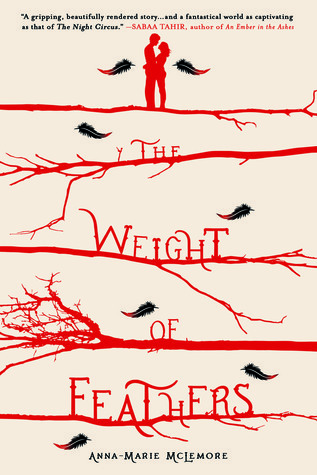 Sign into Goodreads to see if any of your friends have read The Weight of Feathers.